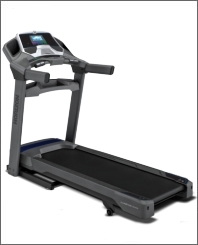 Horizon Fitness treadmills offer a variety of innovative and advanced features that make them an excellent choice if you’re looking for a full featured treadmill for a great price. Horizon Fitness offers an exceptional variety of treadmill models designed to fully meet your fitness needs while taking it easy on your pocketbook. Horizon Fitness stands behind every piece of equipment that they manufacture and they completely guarantee your satisfaction. Simply purchase your machine (direct from Horizon Fitness) and give it a thorough workout for up to 30 days. If you're not 100% satisfied with the results, simply contact their customer service department for a Return Merchandise Authorization number and return the machine (including any accessories) in its original condition and packaging to receive a full refund, less return shipping & handling. 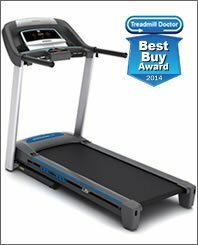 The Horizon Fitness T101 treadmill, recipient of Treadmill Doctor's Best Buy Award in 2014, offers numerous features that make it an excellent value for fitness buffs who are looking for an affordable, yet full-featured treadmill. Features such as Horizon's exclusive FeatherLIGHT folding lift system and PerfectFLEX deck cushioning, console with multiple LED displays, powerful and quiet 2.25 CHP motor, and built-in speakers and cooling fan add up to a powerful fitness solution that's offered for an affordable price. The Horizon Fitness T202 treadmill offers all of the great features you expect from Horizon Fitness while adding a few that you may not expect in such an affordable treadmill. In addition to Horizon's FeatherLIGHT folding lift system, roomy 20" x 55" treadmill deck, PerfectFLEX™ PLUS cushioning system, powerful yet whisper-quiet 2.5 CHP motor, and Sonic Surround speaker system, you also get Nike + iPod functionality which allows you to save your workout results to your iPod. Advanced features like this make the Horizon Fitness T202 treadmill a perfect choice for runners who are ready to take their workout to the next level. 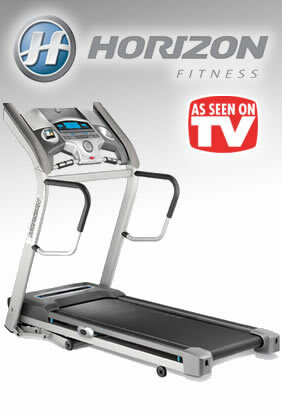 The Horizon Fitness T303 treadmill incorporates all of the top features and technology that Horizon Fitness has to offer. The T303 is packed with awesome features like an extended running surface measuring 20" x 60" designed for runners with long strides, a nearly silent heavy-duty 2.50 HP motor, 3-Zone variable cushioning for an exceptionally comfortable workout, Horizon's Advanced Goal Center with large backlit LCD, great sounding mp3 compatible speaker system, COOLfit fitness fan, and a comprehensive array of workout programs. 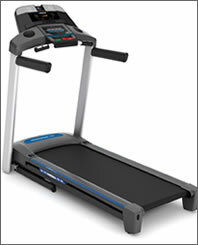 This treadmill is designed expressly for discerning runners who desire advanced functionality for a very affordable price.